I really love to eat batter ... cake batter, pancake batter, cookie dough, I always lick the bowl! So if the dough is the best part of the cookie, why wouldn't you sandwich chocolate chip cookie dough between two chocolate chip cookies? I would. You should. This is totally the best of both worlds—cookie and dough all in one bite. Best part? The dough is completely egg free and whipped like a frosting making it safe and deliciously fluffily. These are a great birthday treat, delectable gift, or decadent afternoon snack. You won't be disappointed. Mix melted butter, sugar and brown sugar together in a medium bowl with a rubber spatula. Add vanilla and egg; stir until combined. Add baking soda and salt and stir. Add flour and stir until everything is just combined. Add mini chocolate chips and stir until just combined. Use a cookie scoop to scoop out dough onto cookie sheet. I like to use a small cookie scoop to make mini cookies (remember you are going to be sandwiching them together so really you'll be eating two in one). Place in 350 degree oven for 9 to 10 minutes. Do not over bake. Makes approx. 24 small cookies. Place on cooling rack and let cool completely. In the bowl of an electric mixer fitted with a paddle attachment, beat the butter on high speed until creamy (about 1 minute). Switch the mixer to medium speed and add the brown sugar. Beat until combined, scraping down the sides and bottom of the bowl as needed. On low speed, add the vanilla, flour, and salt. Beat until everything is mixed; the dough will be thick and heavy. Add the milk and beat on low for 30 seconds to fairly mix it in. Then switch to high and beat for at least 2 minutes until combined and very creamy. Gently fold in chocolate chips. Set aside at room temperature until ready to use. 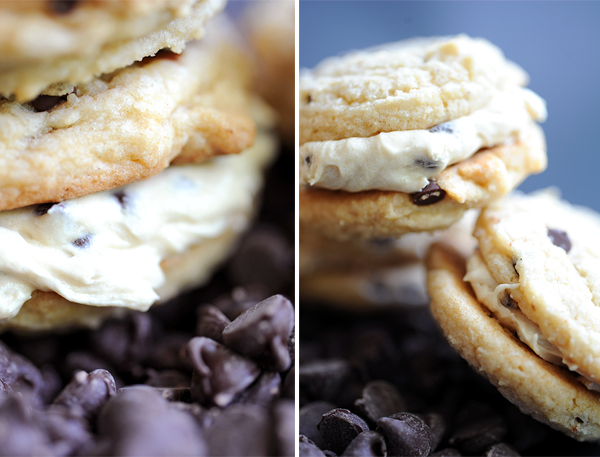 Sandwich dollops of cookie dough frosting between two cooled cookies, creating sandwiches. Store in an airtight container in the refrigerator for up to 3 days. Frosting recipe adapted from Sally's Baking Addiction.